So your friends just moved into their new apartment and they’re super excited to show off their new digs to you, the VIP in their life. They’ve invited you over for a little get-together on Saturday night and you’ve graciously accepted. After all, they’ve been so busy with their move that it’ll be nice to catch up. Meanwhile, in the back of your mind, you hear your mom’s voice reminding you not to show up empty-handed. No worries, finding a housewarming gift doesn’t have to be as hard as shopping for Birthday gifts. So we’ve done some Pinterest research and compiled a list of easy gift ideas for you! If you’re looking for a gift that everyone will love, choose a new game to add to your friend’s collection. Games can make any party more fun and lively. And, who knows, maybe they’ll invite you over for fun times more often. Games for larger groups of people work best, like Monopoly, Taboo, etc. Okay, so this one is pretty self-explanatory. And we’re pretty sure you probably already thought of this one. But if you know your friend really well, go the extra mile and get them the brand of wine that they love or have been telling you about lately. If they like wine, but you don’t know their favorite. Introduce them to yours. Oh, and if they don’t have a corkscrew… well, that might be handy too. While we were searching for the coolest housewarming gifts, we came across this awesome Ice Cream Sundae Kit. This is a great idea if you’re a DIY’er and into giving homemade gifts. Throw together some of their favorite ice cream toppings, a few cones, and put in a little note to “Just Add Ice Cream” and you’ll be the sweetest friend ever. Every home can use a little greenery. If your friend has a balcony, some potted perennials might add that extra pop of color! If they’ve got limited space or your friend just doesn’t have a green thumb, succulents or bamboos are a great alternative and require less light and nurturing. And if they’re into cooking, they might really love an herb garden! TIP: A spider plant is always a safe one to get if you’re at a complete loss. They are so easy they almost care for themselves. AND you can plant their babies! BONUS! If you’re into giving practical gifts, this one’s for you. We all know how stressful moving and setting up your new home can be. So when your friend is stuck trying to figure out where they put that picture hanging kit or their tape, come to the rescue with a basket of useful things. Sometimes simple is better. A candle is not only practical (in case of power outages, etc.) but it smells great and the options are endless. Plus, you can choose your friend’s favorite scent, or even their favorite color if you want. Does your friend have pets? Don’t forget that it’s their new home too. You can bring Fido a new toy or a sweet treat. We guarantee Fido will be your bestie forever. 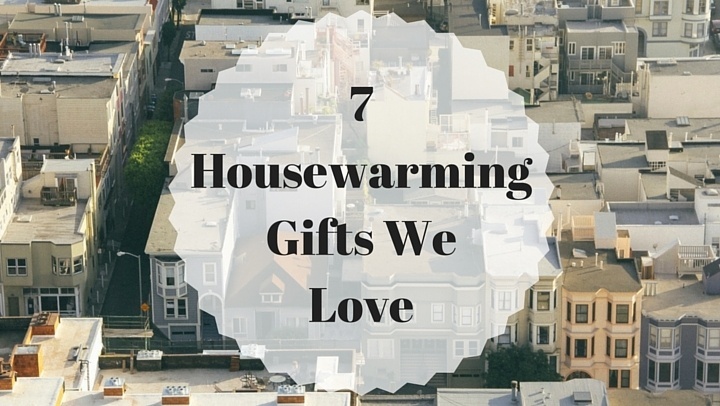 We’d love to hear your favorite housewarming gift ideas! Send ‘em our way!